A meeting took place in Perth City Hall on 19 May 1842 at which a committee was formed to pursue the establishment of a School of Industry in order to check the increase in juvenile delinquency. By the end of the year, accommodation for the institution had provided in part of the King James VI Hospital, on Hospital Street in the centre of Perth. The rooms adopted for this purpose were in the east and and highest storey of the Hospital, and consisted of a work-room, sleeping-room, kitchen, and bed-room for the superintendent. The work-room contained two spacious tables, running parallel to each other, with forms or seats of corresponding length. The walls were hung with a profusion of prints, chiefly zoological in their subject — the gift of some benevolent ladies. The sleeping-room was furnished with four massive horizontal frames, raised about 2½ feet. from the floor, on each of which six hammocks were slung, each containing a sheet, a blanket, and a heavy warm rug or coverlet. The School, initially admitting only boys, received its first inmates on 1 January 1843. The superintendent of the establishment was Mr Isles. The School site is shown on the 1860 map below. Boys' School of Industry site, Perth, c.1860. A small School of Industry has been opened for destitute boys, which I hope will soon extended girls also; and I hope that its use will be enlarged by the admission of children who live with their parents at night, but who could attend the School during the day. The School was opened at the beginning of the year, and now contains 20 children. They are employed chiefly in knitting; they have instruction reading, writing, arithmetic, singing, and religious and general knowledge. At arrival, I found the children receiving a lesson on the geography of Scotland, from the son of the Sheriff-Substitute, and many of them showed that they were acquainted with the most of the principal towns and rivers. They were afterwards practised in singing, and I examined their knowledge of the Bible, and in miscellaneous information — in all of which they acquitted themselves creditably. As an encouragement to work well, the children are allowed one halfpenny for each pair of socks which they knit; and their eagerness to get a little money causes them sometimes to rise as early as four in the morning. Most of the children have lost one or both of their parents, or have parents of bad character. Many are the offspring of criminals, and almost all have either been in prison, or have gone about begging. It might have been supposed that children accustomed to so irregular a life could scarcely be brought to submit voluntarily to the discipline of such am institution, kind though it be; but this is not the fact, for although no compulsion is used to oblige the children to remain, only three have left of their own accord since the place was opened, and one of these soon afterwards begged earnestly to be allowed to return, and is now going on steadily. The children had a healthy and cheerful look, and several of then) had intelligent countenances. The room also in which they work, eat, and have instruction, had a pleasing appearance, being hung round with the spirited prints of animals, published by the Christian Knowledge Society. The rooms have been obtained without payment of rent. The food, which seems to be abundant and nutritious, cost but little more than 2d. a day for each boy, and the clothing is simple and unexpensive. As intimated by Mr Hill, a Female School of Industry was opened in a separate part of the Hospital building at the end of 1843. On 23 December 1854, the boys' department was formally certified under Dunlop's Act to operate as a Reformatory. Initially, the school seems to have been little used by magistrates — in October 1858, only one boy was there under a court order. In 1862, the establishment was redesignated as an Industrial School, which led to an increase in committals. In November 1862, 18 of the 52 boys were under detention. As well as their classroom education, the boys were employed in tailoring and gardening, and all were taught to knit. In 1863, a new Industrial School for 150 boys was erected on a three-acre site at Wells Hill (or Wellshill) in Perth, funded by a legacy left for the purpose by Mrs Fechney (or Faichney) or Ardargie. However, since the objects of the new institution were identical with those of the existing School of Industry, it was eventually agreed that a union should take place between the two. The Wells Hill building was formally certified for operation on 7 March 1864, with accommodation for up to 150 boys. The official opening of the Fechney Industrial School for Boys took place 4 April 1864, with 56 boys from the Hospital premises moving to their new quarters. Each boy carried his kit in a knapsack and a procession marched through the streets of the town, accompanied by the boys' flute band. The girls' section of the School of Industry continued to operate in the Hospital building. Originally, charge of the new school was to have been placed in the hands of Mr and Mrs Ferguson, who had run the boys' department at the Hospital site. However, it decided to alter this arrangement and in their place Mr Kinnoch was appointed superintendent and Mrs Reid as matron. A schoolmaster attended for three hours a day. The industrial training now consisted of gardening, tailoring, and shoemaking, with netting, paper bag making, and knitting stockings for the younger boy. The boys also helped in the house and laundry work, and in winter cut and bundled firewood for sale. In 1865, another change of staff took place with the appointment of Mr and Mrs Gellatly (or Gellatley) as superintendent and matron. Following Mr Gellatly's death the following year, the assistant master, Mr James Hutchison, became superintendent, with Mrs Mary Gellatly continuing as matron. In 1868, an additional dormitory was fitted up and all the boys now had separate beds. It was reported that since the school had been brought into full operation, the juvenile ward in the city's prison had been unoccupied, and the £2,000 previously voted for its enlargement remained unspent. Carpentry and wood-turning were now being added to the industrial training. In 1870, the Girls' School of Industry joined the boys' at Wells Hill, occupying buildings at the north of the site. Some substantial new buildings were also erected in the boys' section in 1873-4. The Wells Hill site is shown on the 1900 map below. Wells Hill Industrial Schools site, Perth, c.1900. In 1874, bobbin making was added to the industrial occupations, using steam-powered machinery. 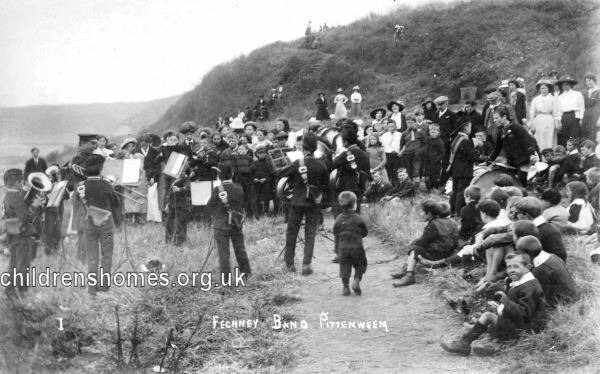 A boys' band was now in operation, instructed by a visiting bandmaster. A home for boys discharged from the school was established in the city. In 1878, three acres of land was taken on a long lease for use as a playground and garden. A cow-house and stable were built on the latter. In 1883, it was reported that about 900 gross of bobbins were being produced at the school each week, and that the school turner's shop did most of the work required by the town and the country round Perth. The shoemaker's shop carried out all the work for the school and for the city's two girls' schools, and also some for the Mars Industrial School Ship. In 1887, the old block of workshops was cleared away and new shops erected at a cost of nearly £2,000. Further building work the following year provided a new dining hall, kitchen, store rooms and a dormitory to replace the existing attic one. A mark system was now in operation A boy of good conduct could earn up to 6d. a week, and was allowed to visit his friends on Saturday afternoons. In 1892, more new buildings included a gymnasium, a lodge and a swimming bath. A large fire escape had been installed by which any of the windows could be reached. The school had a telephone to the town, and speaking tubes from all the dormitories to the superintendent's room. The matron, Mrs Gellatly, resigned in August 1901 after 35 years' service. She was succeeded by the superintendent's daughter, Miss Eliza M. Hutchison, who had previously been employed as the school's office assistant. In the same month, the workshop range was accidentally burnt down and was subsequently replaced by a new and improved building in a different location. In 1905, the school's cricket first eleven won five out their seven matches. At the Pert Arts and Crafts Exhibition, the eight boys competing from the school carried off four 1st, two 2nd and two 3rd prizes. The operetta 'Caractacus' was performed by the school in the City Hall. In 1906, the school spent a summer holiday on a farm at Ochlis. That year's inspection report expressed concern over its record of health, especially the number of cases of tuberculosis occurring. The inspector highlighted the apparent difference in size and appearance of the Fechney boys compared to those at the city's girls' Industrial Schools, and suggested that the boys' diet might be improved. He also proposed that, given the large proportion of small boys in the school, a special junior department might be created, having its own dietary, clothing and boots. The following year it was reported that the quality of the bread had been improved, extra butchers' meat was being served, and an additional cow purchased. Mr and Miss Hutchison retired from their posts at the end of June 1909. Mr Hutchison, who had been superintendent for over forty years, died later the same year. Mr R.M.D. Barnes and Miss M.C.A. Barnes were appointed as the new superintendent and matron. Other staff at this time comprised: head schoolmaster, Mr C.R.B. Mapstone; assistant schoolmaster, Mr S. Buckenham; assistant matron, shoemaker, tailor, turner and assistant, sawyer, lorryman, gardener, assistant gardener, cook, sewing maid, visiting gymnastic and swimming instructor maid. Following a decline in numbers, the closure of the school was announced in July 1922. Its premises were subsequently absorbed by the neighbouring Industrial School for Girls. The site is now occupied by modern housing. Perth and Kinross Council Archive, AK Bell Library, 2-8 York Place, Perth PH2 8EP. Has some plans of the building.